Liz's Paper Loft: MCT February Release Sneak Peek Day 2 ~ bunnies! It's Day 2 of My Creative Time's February Release Sneak Peeks! Today I get to share with you two new products. The first is Cute Stitched Egg Tag Die and the coordinating stamps Egg Decorations. Also I have two projects to share! On the background I used watercolor paper, distress ink, perfect pearls and white acrylic paint to create the "galaxy". Next I heat embossed the white zig-zag stamp. If you look closely I stamped the polka dots on the egg with versamark ink. The bunny was colored with copics, then I added bit of wink of stella to the ears, belly and eggs, Also I added glossy accents to the eyes, nose, and eggs. For my next project stamped the leaves in fog on the white and blush on the pink. 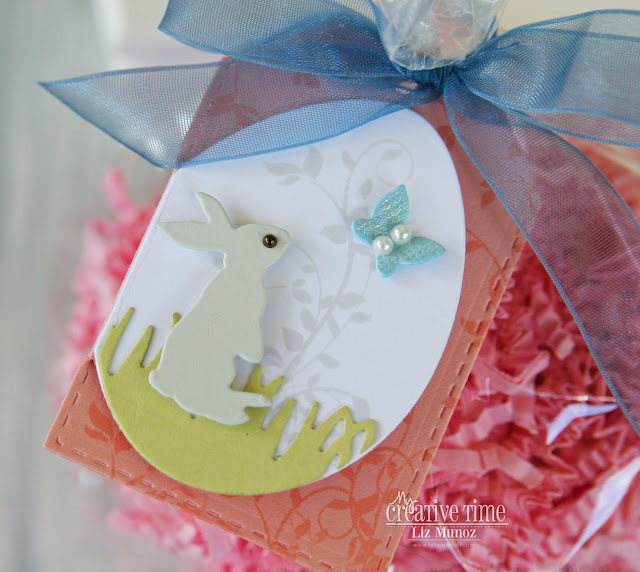 A die cut bunny, butterfly, and grass complete this tag. OMG Miss Liz your Card and Tag are both so Gorgeous!! WOW What a way to Showcase Today's Sneaky Peek!! You sure did two Incredibly Outstanding Creative jobs!! YOU so ROCK!! 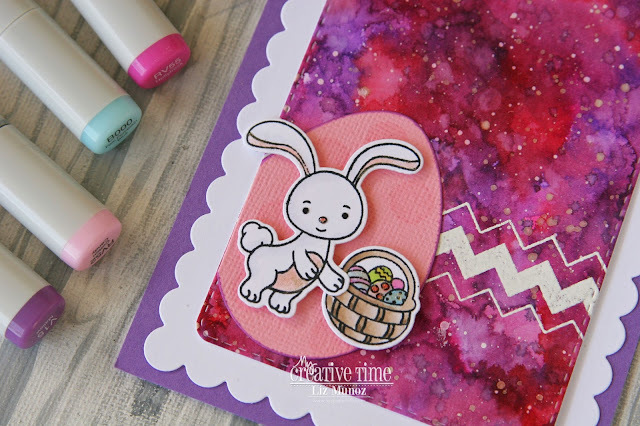 Awesome background on your card...it looks great with the embossing and bunny egg. The scallop frames it all nicely. I love how you decorated the tag and how you used throwback bunnies and other stamps and dies. MCT has it all. EGG-ceptionally adorable projects! Your pinks/purples galaxy is stunning! Love these! Love how you used the pieces to make a fun card! Your tag is absolutely beautiful! The card is so cute...love the background! And the scene on the tag is so sweet! Fabulous background on the cute bunny card and love the sweet bunny tag. Your projects are stunning!! Love your galaxy background on your card. You knocked it outta the park again. Fabulous projects. Your tags are very cute. I like the tag colors you chose.